August 26, 2008 - Make sure you like EcoJoes on Facebook to stay updated on green ways to save money and help the environment. Just click the "like" button below. Muchas gracias! Last week I came home to find a large cardboard box from Papa Spud’s. What is Papa Spud’s, you might ask? Welp, Papa Spud’s is a company that delivers mainly local, mainly organic fruit and vegetables to Raleigh and its surrounding towns. Almost all their produce comes from inside North Carolina, which means that you’re supporting local farmers plus cutting down on the transportation pollution. Here’s the plethora of nutritious vittles that greeted me when I tore open the box. Please note the insulating lining that keeps the produce nice n’ cold. 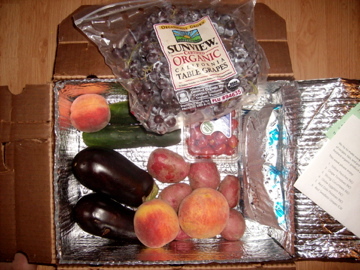 Since I opened the box, I’ve tried all of the foods and have only an eggplant and some grape tomatoes left. It was dang good, with no messed up fruit or vegetables. The grapes and peaches were especially good. I’m about to finish up the eggplant and tomaters tomorrow. Oh yeah, they reuse their insulated boxes. Each week, you put them outside on your doorstep, and they pick them up when they bring your new vegetables. A simple, efficient, non-wasteful system. Anyhoo, if you live close to Raleigh, you should go check them out. Their website explains how you can start getting local, organic food delivered to your house this week. The best thing about it is that it encourages you to try some new healthy foods, plus support yo’ local farmers, all without leaving the comforting womb of your own home. Posted in food, green business, health, organic	on Tuesday, August 26th, 2008 at 8:37 AM.